Rainbow Bridge when Lake Powell reservoir levels are very low. Rainbow Bridge is a timeless natural wonder that became a National Monument in 1910 by Executive Order from President William H. Taft. Congress gave such authority to any president of the United States under the Antiquities Act of 1906, to protect lands of the Public Domain that contain Indian ruins and artifacts, or to protect landscapes for their contributions to science. The administration of national monuments currently falls under the jurisdiction of National Park Service, which was formally established in 1916 as an agency of the Department of Interior. Navajo Mountain is an igneous intrusive mountain (a laccolithic structure) in the Navajo Nation, which is the largest and most populous Indian reservation in the United States involving three states (Arizona, Utah and New Mexico). The mountain and its community are in the state of Utah, San Juan County, with Monticello being the distant county seat. Access to Navajo Mountain requires traveling on the highways of northern Arizona. The largest community in the immediate area is Page, Arizona. Rainbow Bridge National Monument is a case study about internal contradictions within the U.S. Congress and the Department of Interior. On one hand Interior has a preservation mandate to fulfill, and on the other hand a mandate of economic development. Interior also has an obligation by treaty toward Indian heritage, which includes the Navajo Nation. For Rainbow Bridge this clash of missions is manifested between three agencies of Interior, namely the National Park Service, the Bureau of Reclamation and the Bureau of Indian Affairs. The Bureau of Reclamation began building Glen Canyon Dam in 1957, which created the second largest man-made reservoir in the United States, Lake Powell. When full, the waters of Lake Powell reach into the monument, and even beyond the natural abutments of Rainbow Bridge.The reservoir inundated many sacred sites of the Navajo culture, which begs the question: how would you feel if the government buried your sacred places under a reservoir? This tragedy should never have occurred for reasons of respect toward culture, agency mission statements and federal law, and demonstrates how such willful disrespect breaks the integrity of government. Click here and here for objective analysis on the controversies. 20,000 BP (before present) - Global cooling, during the last ice age, peaks. The climate on the Colorado Plateau experienced more moisture and less evaporation which, compared to today's climate, increased streamflow and runoff for the Colorado River and its tributaries. During this time-period Rainbow Bridge formed when the original meandering stream bed (diagram), that once looped around a solid fin of Navajo sandstone, was abandoned, and the flow was then redirected straight through the fin. Subsequent erosion has since created a near-perfect natural bridge. The bridge dimensions (diagram) are: 290-foot-high with the open area of the span at 275 feet across. The top of the span it is 42 feet thick and 33 feet wide. Note: The source of the diagrams for this article come from the book Rainbow Bridge: An Illustrated History, by Hank Russell, and available for purchase at Utah State University Press. Carson of the US Army defeats the Navajo and marched them (The Long Walk) into exile at the Bosque Redondo Reservation at Ft. Sumner, New Mexico; this unjust captivity ends in 1968. However, several Navajo groups evade the Army and hide in the Navajo Mountain region of Utah, which is also inhabited by Paiutes. Except for these indigenous people, knowledge of Rainbow Bridge remains hidden from the rest of the outside world. 1906 - John and Mary Louisa Wade Wetherill established a trading post at Oljeto, Utah, and hear stories of this natural bridge. 1907 - Dr. Byron Cummings, Dean of Ancient Languages and Literature at the University of Utah undertakes a survey of the three huge natural sandstone bridges in Utah's White Canyon, west of Blanding. 1908 - The natural bridges of White Canyon are designated for federal protection by President Theodore Roosevelt as Natural Bridges National Monument. 1909 - Cummings and William B. Douglas form a discovery expedition to locate Rainbow Bridge, which is organized by John Wetherill. The guides are Jim Mike, a Ute, and Nasja Begay, a Paiute. Article of expedition by Stephen C. Jett. 1910 - President William H. Taft proclaims Rainbow Bridge a National Monument. 1913 - Theodore Roosevelt and Zane Grey visit Rainbow Bridge. 1956 - The building of Glen Canyon Dam on the Colorado River was authorized in 1956 by Congress and debates, about this new reservoir inundating a federally protected national monument, escalate. 1963 - The river bypass gates at Glen Canyon Dam close and the reservoir (Lake Powell) begins to fill. The rising waters will encroach into the monument in the early 1970s. 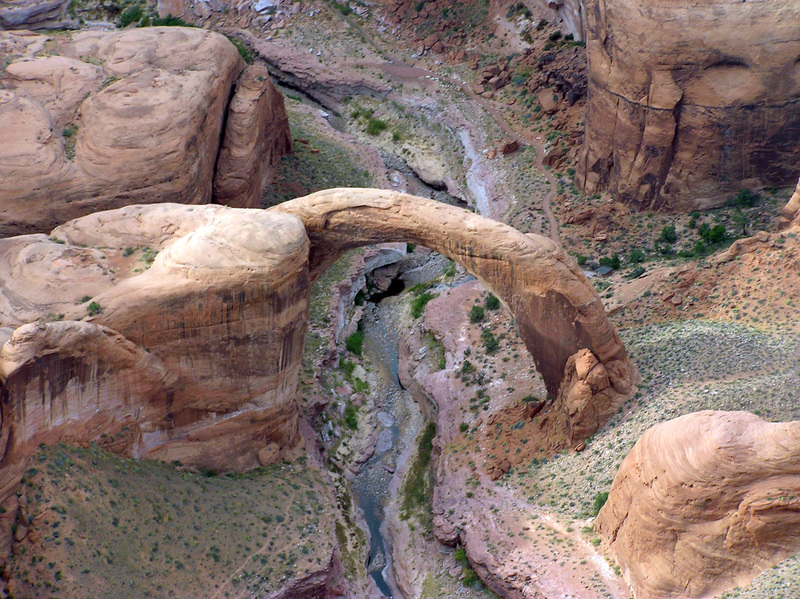 1973 - Friends of the Earth (founded by David Brower), Wasatch Mountain Club and outfitter Kenneth Sleight file suit in federal court to keep the rising waters of Lake Powell out of Rainbow Bridge NM. The defendants are Department of Interior, Bureau of Reclamation and National Park Service. The case was upheld by US District Court in Utah, but was later lost in the appeal process. 1974 - Navajo medicinemen, who live in the vicinity of Navajo Mountain, file suit in U.S. District Court against the Secretary of the Interior, Bureau of Reclamation, and National Park Service. 1993 - The National Park Service adopts a General Management Plan for Rainbow Bridge. 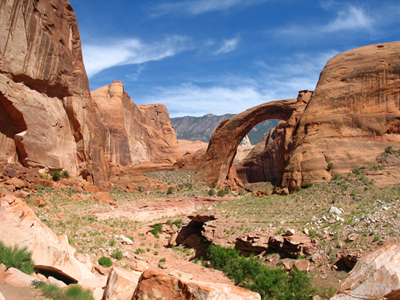 It offered a long-term plan for mitigating visitor impacts and preserving the resources of Rainbow Bridge, despite the ironic fact that the Department of Interior did not provide the necessary leadership to protect the monument from degradation as the consequence of constructing Glen Canyon Dam. Administrative History of Rainbow Bridge NM (cached). National Park Service. Photo of Rainbow Bridge when Lake Powell is full. Aerial photo of Rainbow Bridge. Photos along the trail from Navajo Mountain to Rainbow Bridge. Repeat photography of Rainbow Bridge. Satellite view of Navajo Mountain region. NASA. Navajo Mountain and Rainbow Bridge Religion. Museum of Northern Arizona. Karl W. Luckert, 1977. Did Prospectors See Rainbow Bridge Before 1909? Utah Historical Quarterly article by James Knipmeyer. Sacredness of Rainbow Bridge. Plateau Magazine, 1973. Stephen C. Jett. Amicus Brief from coalitiion of Indian groups. Trail to Rainbow Bridge. Desert Magazine. 1941. Professional field trips to Navajo Mountain and Rainbow Bridge.